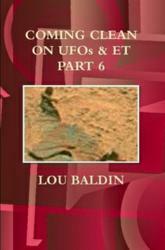 Coming Clean on UFOs and Extraterrestrials is a blog that the author Lou Baldin began on January 12, 2007 at the Above Top Secret (ATS) site and later compiled the thread into six books. We crave the ability to understand the gods yet we stumble over the very basics of understanding the humans next to us. Coming Clean on UFOs and Extraterrestrials Part 6 is the final in a series of six books, which covers a yearlong discussion concerning UFOs and Extraterrestrials between the author and hundreds of posters at the ATS website, said Baldin. The website receives thousands of visitors each month and the author’s thread was the top thread in 2007, having garnered the most replies and hits than all other threads at the website during the same period, according to Baldin. Although UFOs and Extraterrestrial discussions were the main focus on the thread, Baldin answered myriads of questions concerning the afterlife, Karma, reincarnation, philosophy, spiritualism and everything to do with the human condition including whether or not animals have souls, said the author. Baldin’s predictions have been proven accurate such as the recent capture on film by NASA and amateur astronomers of solar mass ejections produced by the sun in such amounts to create planets, a fact many astrophysicist claimed was impossible, states Baldin. Baldin said that life on Earth is not simply an accident of nature but rather created and nurtured by Extraterrestrial beings from various star systems in the Milky Way galaxy. These beings deposited life on this planet and created/manufactured illusions of past and future events to keep the secrets of mankind’s origins hidden from humans, said the author. Baldin has written 14 books and authored hundreds of webpages, several blogs, and numerous threads on personal websites: ufolou.com and baldin.proboards.com, as well as on other nonaffiliated websites. Baldin provides insight into social, political, economic and religious issues that concern and affect humans as well as the ecosystem that supports humans while they serve out their time on planet Earth, said the author. Playpen Earth was created for the exclusive purpose of developing human souls as is true in the countless and similar star systems with Earth-like planets that make up much of this galaxy, said Baldin.